I'm definitely a creature of habit. 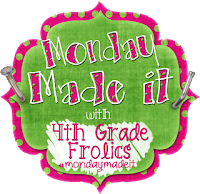 So in typical Monday fashion, I decided to link up with Tara from Fourth Grade Frolics and Sabra from Teaching with a Touch of Twang for their fantastic Monday linky parties! Now, I'll admit, I wasn't as productive as I would like to be. Last night I was at the Blake Shelton concert until very, very late and so today, I just didn't have the hustle. Plus, I was working a guest blog post that I'll be sharing with you next week! So here are the my Must Have's and Made It's for the week! My laminator! I know, I know I just purchased it last week... but it's already helped me with so many projects before school has even started! I couldn't live without this little guy. This week's Made It's were all thanks to my handy dandy laminator and Teachers Pay Teachers! I couldn't have "made it" without them both! New genre posters from Teachers Pay Teachers. You can find them in Elise Stoddard's store or by clicking here. At first, I wasn't going to purchase them because I just created a new genre wall last year but I wasn't really "in love" with it. These posters are super bright and colorful but they also include example texts with lexiles of 700 or above! Perfect for older readers! Many of the genre posters I've found previous are more primary than intermediate. These posters are perfect... Adventure Fiction for example includes Hatchet, The Hunger Games, and Island of the Blue Dolphins! I made these my own by backing them with neon cardstock from Target and then laminating them! New labels for my nonfiction book bins! I bought so many new books this summer at the public library's used sale, I had to create some new labels! My goal is to expand my nonfiction section and I think I'm slowing getting there! I used a zebra board and bright colors for all the tags. I made 8 tags total and also sent them through the laminator! Here is my pile of "stuff" I'm still working on... laminating my classroom rules thanks to The Tattooed Teacher's TPT store. They are so bright! Check them out here. I'm hoping to find some zebra ribbon so I can string them all together. I also found a great vertical expanding file for organzing graded papers at Deals for only $2 dollars! I made a cute sign to go inside the front pouch. I also cut out tons of words (reading, writing, etc.) for around my room with my Cricut. I used the same neon cardstock I found at Target... but I forgot to take a picture. I also need to laminate the Text Structure posters I purchased from Pinkadot's Teachers Pay Teachers Store. You can find them here. I'm going to create a display with text structures above my nonfiction section of my library! Whew! I'm exhausted! What did you make with your must have this Monday? Isn't the laminator the most amazing thing ever!!!! I LOVE MINE! Thanks for all the wonderful ideas! You're right, it's hard to find things for intermediate and now I have two new items added to my wish list! :) Thanks for linking up! I just bought my laminator yesterday, and it already is my new best friend! I couldn't live without my laminator! There may be better deals on laminating pockets, but if you have a Lakeshore Learning store near you, they've got them for 25% off right now. Thanks for stopping by my blog for my 100 follower giveaway. I'm now your newest Bloglovin' follower! I've been eyeing that laminator all summer! I keep putting it off because I figured I could just laminate at my school, but I can only imagine how long the line will be once school starts... Yikes!